Preschool Playbook: Santa Claus is Coming! Today was the day! Excitement was the main ingredient on the menu. Yes, today we got a visit from Santa Claus. How wonderful! So much amazement, you just can't imagine. We are very lucky to have a member of the church volunteer his and his wife's talents as Santa and Mrs. Claus. They are also wonderful enough to bring a goodie bag for the children. It is a day the children remember and can't wait to talk about. It was great. What was really extra cute today was one of the girls in the class. After Santa left, she went over to our dress up area and got white gloves and a red Halloween costume that looks like a dress--it's actually from one of the Star Wars movies. Anyway, she got all dressed up, went over to Santa's chair and wanted the children to come sit on her lap and tell them what they wanted for Christmas. So as not to break her leg, we set up a little sitting area where the exchange could take place. It was really adorable! So Santa came to visit, the children all got to sit on his lap and tell him what they wanted, then they got their goodie bags. 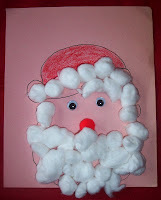 To commemorate his visit our craft today was a what?, that's right, a Santa. It is a very easy craft as time is not in excess today. 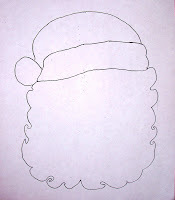 I give each child a copy of the Santa face that I have run off on construction paper. First the children color the top of his hat with red. The glue gets put all over his hat brim, beard, and ball of his hat. I started off using a glue stick, but the children couldn't see when they had covered all the glue, so we switched to Elmer's. I put the glue on, only because we were short on time, if we had more time, I would have allowed the children to do this. After all the cotton was on, I used tacky to mark the place for eyes and nose. The children used wiggle eyes, and the pom pom for the nose. He's pretty cute. The book I read today was a new one we just got from Scholastic. 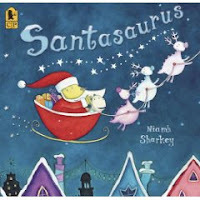 It is called "Santasaurus," by Niamh Sharkey. I thought the children might like it because dinosaurs are just ever so popular. The book is about a dinosaur family getting ready for Christmas. The children all want something special, but Milo's request is the most special of all. Does Santasaurus grant Milo's wish? The children enjoyed it.